DosFreak wrote: dgvoodoo 2 isn't supported on Windows XP since the highest ver of d3d supported on XP is d3d9. You need Vista or higher. Problem is, same thing results in my VMware Vista64. Is only Vista32 supported? If you're running Vista in Vmware then you probably only have d3d9. Check dxdiag. The only way you're going to be able to use dgvoodoo 2 in Vmware with Vista+ currently is to use WARP which will be slow. I'm basing the above on Vmware 12. Haven't upgraded to 14 yet. 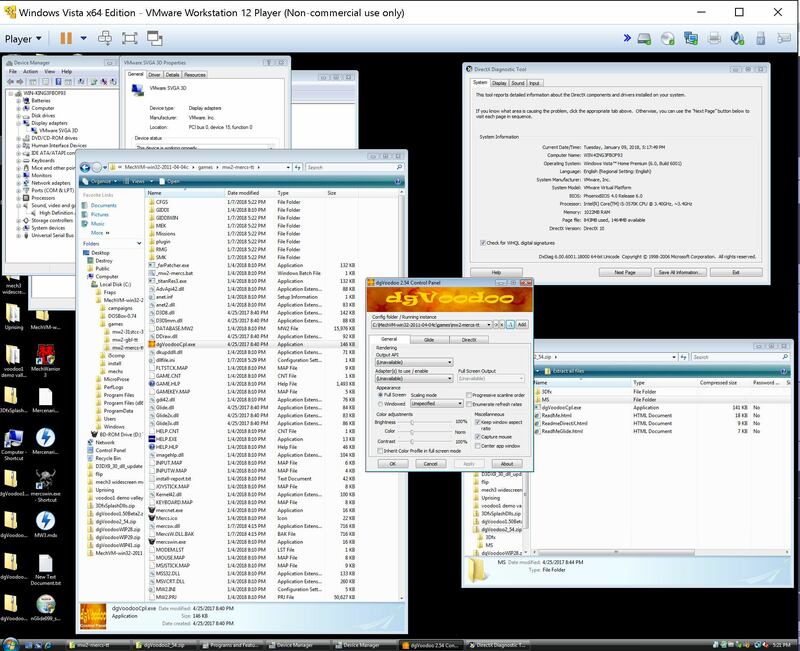 If you right click on my posted screenshot(s) and view image, you will see my VMware Vista64 is running DX10. I can upgrade it to DX11 but have not done so as I haven't had the need. I am certainly no programmer but I don't understand why dgVoodoo1 can work so well in VMware but dgVoodoo2 doesn't? Is it even possible for Dege to make it work? I have no idea how to use WARP to attempt to get this to work. Do you happen to have any relevant links? You have DirectX 10 installed but the video driver in vmware only supports D3D9. Click the display tab. Dgvoodoo 1 works because it supports d3d9. Dgvoodoo 2 does not. This is intentional. I want to say Dege offers the ability to use WARP in dgvoodoo but it might only work on 7 and above. You don't want to use it anyway. DosFreak wrote: You have DirectX 10 installed but the video driver in vmware only supports D3D9. Click the display tab. I guess I don't see where it is DX9 only? Edit: According to this page, VMware12 is DX10 functional. DosFreak wrote: You don't want to use it anyway.
. I hear ya, hence why I really want/hope dgVoodoo2 could somehow work. Aside fwiw, nGlide1.05 has texture smearing or ghosting issues on the top half of the game screen. It looks like with Vmware v12 as long as your VM is running at v12 (mine was at v11) and if you have a supported video card then with Vista+ you will have d3d10 feature level 10_0 support. Well I thank you for your input and help. I'm hoping sometime Dege can possible shed some light on this issue of dgVoodoo2 having Unavailable Output API. Or try Win7. VMware might use a different emulated video card for that too, but i'm not sure. I'm actually surprised that you can get playble FPS using vmware and dgVoodoo. Stupid issue (I think): in Diablo 2 the MSAA option always turn back to "Off" if I set it to "App driven"
You need DirectX 11 for dgVoodoo to be functional because all functionality is accessed via DIrect3D 11 runtime. On Vista, this means you need Service Pack 2 and KB971512. D3DCompiler_47.dll from dgVoodoo download page is also recommended (put it in C:\Windows\SysWOW64), even though the D3DCompiler_43.dll you get by installing this is sufficient for now. Still, despite the latest update log saying WARP should be selected automatically if other variant fails, this still doesn't appear to be the case on my side in Windows 7 VMware virtual machine. 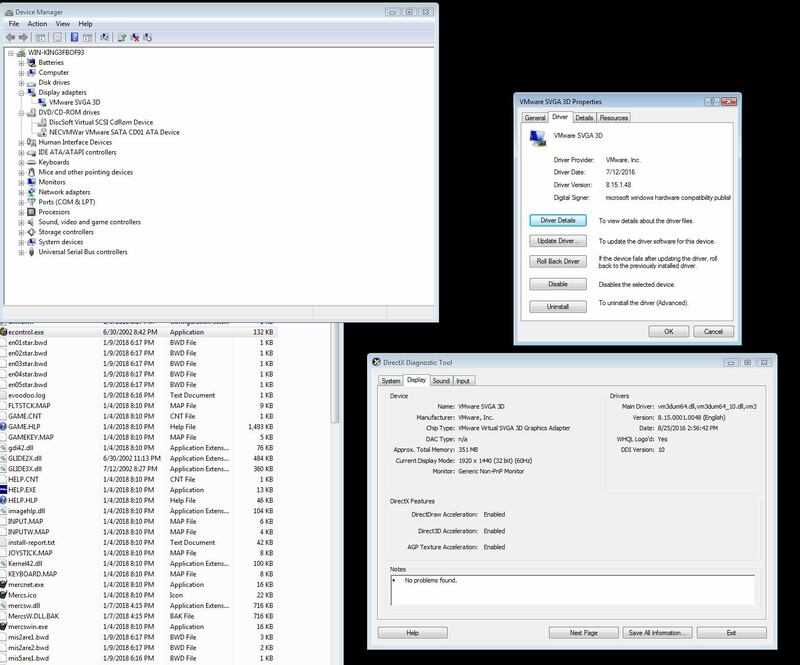 Selecting it manually works on Windows 7, but on Vista, nothing works, both WARP and 10.0 feature level mode fail, something about DDI init failure ends up in the log. Unigine Heaven 4.0 on the other hand works fine when selecting DirectX 11. Maybe dgVoodoo assumes multisampling/anti-aliasing is always available? lowenz wrote: Stupid issue (I think): in Diablo 2 the MSAA option always turn back to "Off" if I set it to "App driven"
Update: it's a bug in the front-end that shows "off" when it should show "App Driven" (maybe with the first app in the list or the last added). Much thanks. Yup, this was it; it seems DX11 is mandatory for the current Voodoo2. Now Voodoo2 sees all the proper Output API's but it still doesn't work; why, well guess what, VMware doesn't support DX11. If Voodoo2 worked with DX10, I'd of been good to go from the beginning. , all this for nothing. Even the latest VMware ver14 does not support DX11 at this writing. Well, at least I learned something and I hope others did too. DX11 is mandatory on the software level, Vista with said update and all newer systems already pass that requirement. What's important here is what features it requires from the hardware. dgVoodoo supports feature levels 10.0 and 10.1, which means graphics card that supports DirectX 10.0 will do, albeit with some restrictions, they're mentioned somewhere in its documentation. So VMware actually passes the minimum requirement in theory. I played various games on my previous PC that used Direct3D 9 Runtime or Direct3D 8 Runtime (d3d9.dll and d3d8.dll respectively). It had NVIDIA GeForce4 MX440, which is a DirectX 7 compliant graphics card. So how did such games run? Simple, they just scaled down and only used features supported by the graphics card. On better hardware, they could use extra graphical candy. Feature levels is the newer term, see this. Yes, UCyborg is right. DX11 is only the library frontend for dgVoodoo but DX11 can drive DX10-level GPU's (DDI or backend), and because of dgVoodoo support feature level 10.0, it should work. - The CPL detects and handles 'DX11 (feature level 10.0)' correctly. - The wrapper itself failed to initialize when tried with a demo. But what were weird is that even WARP didn't support them. I think I'm going to install Platform Update for my virtual Win7 to see if anything changes. Mechwarrior2: I tried to have a look at it long ago but AFAIR I couldn't install (or run?) it because the game always crashed for me. This game is the one that has a custom installer and can be run through DosBox, right? Thank you for looking into this. It would be great if dgVoodoo2 was a working option with VMware. Dege wrote: Mechwarrior2: I tried to have a look at it long ago but AFAIR I couldn't install (or run?) it because the game always crashed for me. The best and easiest way to run Mechwarrior 2 on winXP,Vista or win7 is to simply install Mechwarrior 2 through the latest MechVM program. Yes, I own the original non-3D accelerated version of Mechwarrior 2 for Dos and it works fine in Dos box. Not sure how well a Dos 3D accelerated version works in Dos however. Only a few versions of Mech2 are Dos or have a Dos install option on them. Most 3dfx cards at the time shipped with a windows only version. I think most people, myself included, only have access to a win9x version. Nice to learn something new about VMware's SVGA driver. I totally missed with that anti-aliasing guess, just an assumption from the error thrown by Unigine Heaven when trying to use it. Will be cool to see dgVoodoo in action on VMware. I've read that Interstate '76 uses MechWarrior 2 engine. I76 has a number of odd glitches. I didn't go to deep into it, but have noticed its GDI renderer fails on NT systems, assuming BitBlt function should return the width of the whatever it renders to, which only happens on 9x systems. I wonder if documentation ever said something about that; as long as it returns positive value, everything's OK. And the game must run at 20 FPS due to physics. The fan forum says 24 FPS is the golden number, but I always thought 20 is better for correctness, it's hard to tell honestly. The gold patch also brings in some new problems (and a Glide2 renderer). The most interesting thing about its Glide renderer, I only managed to get it working without glitches with dgVoodoo1, with the two magic settings: Texture mem size set to maximum (65536 kB) and Texmem scaled to 4MB enabled. Otherwise it would glitch, textures flashing, being randomly replaced with others to be precise. Supposedly this occurs on the real Voodoo card as well. Mech 2 Win 95 edition (and GBL and Mercs) works great on my vmwar-ized WinXP SP4 (4!) with an old injector called "MWhook". lowenz wrote: Mech 2 Win 95 edition (and GBL and Mercs) works great on my vmwar-ized WinXP SP4 (4!) with an old injector called "MWhook". And it works on 3dfx with any version dgVoodoo2? NM: Dumb question. Brain faded this morning. Answer: no, dgV2 or WIP requires DX11. Last edited by Destroy on 2018-1-13 @ 14:51, edited 1 time in total. "The file MW2SND consists mostly of binary data, but starting from offset 38h (56 decimal), there is a filename. It may be either MCGA.DLL, or VESA480.DLL. Change it into VESA768.DLL and save the file." Last edited by lowenz on 2018-1-13 @ 14:18, edited 1 time in total.